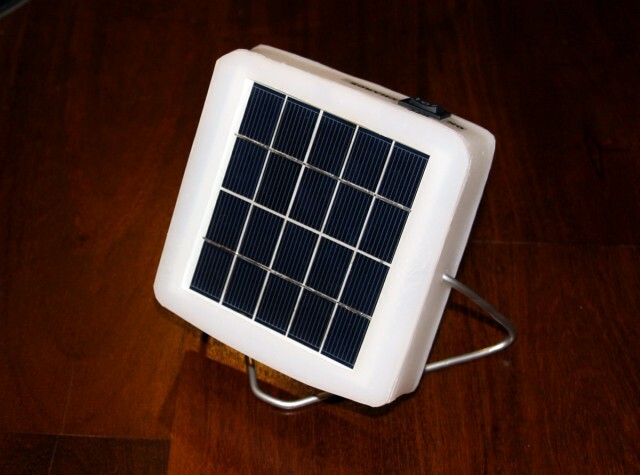 A hand-made solar lamp that helps with energy and health, as well as the wallet. — By John Timmer – Last week, I got notification that there was a package waiting for me at our corporate headquarters in Times Square. 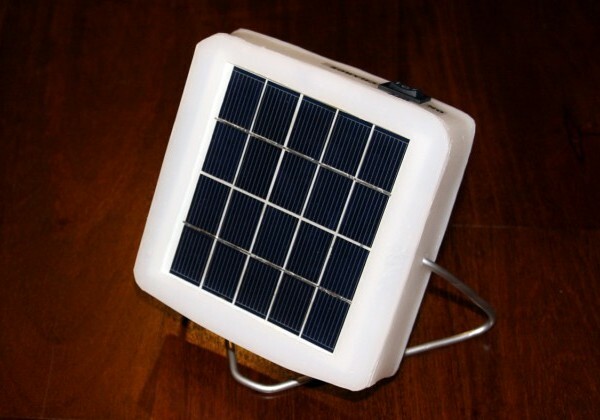 The customs declaration announced that it was a solar-powered lamp. That on its own didn’t surprise me. A variety of organizations have been promoting these as indoor lighting for places that aren’t on the grid, and I’d covered just how significant the health benefits of this lighting can be since it would displace fuels that create lots of indoor air pollution. But opening the package brought a rather unexpected surprise. There was a solar lamp inside, but it wasn’t the sort of thing that I’d expect from a large aid organization. It was clearly made by hand, with rough edges in its white plastic and the On/Off labels stuck on with adhesive. The letter that accompanied it told an interesting tale. Its manufacturer, Simon Lule, was making these himself in a workshop in Kampala, Uganda, selling them for the price of about two months’ worth of kerosene, the fuel of choice in the area. Simon was raising awareness of his work after launching a fundraising campaign hoping to buy some equipment that could injection-mold the plastic. And he was hoping that an article on his work would raise the profile of his campaign. We’ve been able to confirm Lule’s description of the power and lighting situation in Kampala through someone in the US Military who’s stationed there. And, through e-mail and a Skype call, he was able to provide a lot of detail regarding how the hardware came to be and is now produced—details that are consistent with the unit we have and the video he’s produced. Lule told Ars that the whole thing started when he returned home to Uganda from London to visit his grandparents. Although Uganda does have a limited electric grid (it generates most of its power from dams on the Nile River), most of the population doesn’t have access to it. The CIA World Factbook rates the country as 139th of 216 countries in terms of electricity consumption, barely edging out New Caledonia. The organization says that “unreliable power” is holding back Uganda’s economic development. Lule said that only eight percent of the country’s population has access to the electric grid, a figure consistent with other sources we’ve checked. Lule’s grandparents are among the remaining 92 percent and were lighting their house with kerosene. As we learned late last year, burning fuel indoors for lighting and cooking kills more people every year than malaria; Lule put the health impact at the equivalent of two packs a day of cigarettes. He also told us that the fuel costs over a dollar a week—not a small figure, given that Uganda’s average per-capita income is only $1,400. So, his first thought was to buy a solar lamp, one that can charge during the day and provide lighting at night. But when he went searching for a product in Uganda, all the options were expensive and didn’t run long enough to be useful. So, thinking he’d found a way to both do good and supplement his income, Lule looked into whether he could import them from China. But again, none of the options would actually work well due to either cost or performance. So, Lule did something that most of us wouldn’t consider: he figured out what it would take to build his own. When we asked him whether he had any background in electrical engineering, he laughed and said “My degree was in digital media, which is basically creating media for the Internet. I would have worked in advertising—that’s the correct field.” But he managed to teach himself what he needed through an unexpected source: YouTube. There, he found videos on basic electronics from well-known sources like Make Magazine and some more obscure ones like the Afrotechmods channel. With that information in hand, he set out designing his light, finding a contractor in China to manufacture the resulting circuit board. The molds for the plastic presented their own challenge. “There are machinists in Uganda who can do basic molds, so I did that with hard aluminum,” he told Ars. “But the problem with that is that you can’t take the plastic out once it’s not melted. If you look at my tools, they’re all flexible. When the plastic cools down, they flex a little bit, and I can slide the plastic out.” Once the pieces are out of the mold, excess plastic is shaved off by hand, and panels are sealed together by heating them on a hotplate. Unfortunately, he’s the only one who can seem to do so without breaking the metal molding, which puts a severe limit on the number of lamps he can manufacture a day. Currently, that number stands at three, which is why Lule is so interested in obtaining the hardware he needs to mass produce these things—though he may still have to get the pieces to stick together by partially melting them on a hot plate. Despite all the labor involved, Lule is able to sell these at $12 each. He estimates that this is about the cost of two months of kerosene for fuel lamps. At the moment, he’s selling all that he can manufacture, often needing to tell people their orders will take a few days to be made. All of the lanterns are being sold in Kampala as well. Although the city is served by a grid, uneven development and the high cost of power have left many of its residents relying on lanterns to light their homes. Although not exactly polished, the light itself looks reasonably good. It’s compact and fairly lightweight, and it clearly doesn’t need an owner’s manual. Its lone control—a switch—is labeled. It’s fairly lightweight, though I wouldn’t carry it on a backpacking trip. But the key thing is that it works. I’m using it in the middle of winter in New York City, where the weather’s been on the cloudy side of nice for most of the time I’ve had it. So far, this hasn’t run the batteries down, and Lule said that they’ll probably be enough to provide three evenings’ worth of light if they’re fully charged, so one good day may be enough for a while. The light itself is a bit like a bright nightlight. I’m much happier with my standard LED bulb, but the lamp is enough to let me maneuver safely through my home office and get what I need to done. Set up near my desk, it provides enough light to read. Overall, this light seems to live up to its billing. It’s a neat project, one that addresses two major concerns: development with low-carbon energy and public health. And, at the same time, it fosters local industry and should help make life less expensive for other Ugandans.